“Four years ago Scott Wagner promised voter’s he would fight to cut property taxes. It’s four year later and Wagner has been ineffective, and has failed to deliver… just like so many other Harrisburg politicians,” Mango campaign advisor Matt Beynon said. The ad is scheduled to run alongside Mango’s previous ad targeting Wagner over abortion across the state. The 30-second ad “Unconscionable” features Mango talking straight to camera about Wagner’s comments. The comments are from a Berks County Patriots forum from 2016. The comment is from the 1 hour 19 minute mark. 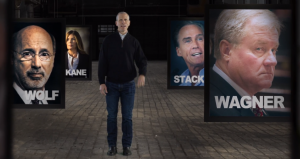 The new ad continues the back-and-forth between the two candidates trying to appeal to conservative voters ahead of the May primary. Update: Wagner’s campaign responded attacking Mango as untrustworthy and defending Wagner’s position on property taxes. “Paul Mango is about as trustworthy on property tax elimination as he is when he goes around telling people he’s created jobs. Scott is the only candidate in the race who has supported eliminating property taxes from the start. He cosponsored and voted for Senate Bill 76 and it will be one of his top priorities as Governor. Paul Mango is a property tax elimination flip-flopper who has gotten so accustomed to lying to voters that he can’t even be truthful about why he now supposedly supports Senate Bill 76,” Wagner campaign spokesman Andrew Romeo said. Anybody that taxes a pension will be a one term governor. Again, yet another episode of the Abbott & Costello of Pa Gov candidates “Mango & Wagner.” This sideshow will play through the primary season and then merge into more episodes where either Mango or Wagner takes the lead to face reality as it all concludes in a crushing defeat by Tom Wolf. Abbott & Costello ie “Mango & Wagner” are very far from a quality Republican Pa Gov candidate like Tom Ridge. Next Nov there will be a defeat of Abbott and Costello ie “Mango or Wagner” and the reset button will be pushed where the Republicans will start all over again. How about asking how the Gov can ignore the death penalty law and let Eric Frein exempt? Keep it up boys. By May that lady from Allegheny County should be creeping up in the poll numbers. Wow. How very strange. Mango is yet another political unknown with his own money. Is he from outer space or what? Bottom line: As weird as the day is long, he appeared with a ‘minister’ wearing a crown while displaying an assault-weapon and claiming teachers pull kids into agendas to make them ‘gay while not teaching math.’ And says the same of our colleges. Caution to voters: we don’t need crazy. To whom is he directing this? It’s very weird. Sorry I even stumbled onto it. Yes! More Governor green screen. Why waste money on doing real ads when you can just use the green screen!